Not seen in the original cut of FOTR, expected in the extended DVD. Click on the pic to the right to see detail on the undress. Note... this is the belted version that was used in the film. Note: Belt being worn high under bust in this shot! Arwen wears a cloak out of the same rose velvet. We haven't spent a lot of time studying this cloak, but it looks like we have another rectangular piece of fabric, maybe only 54" wide with the center "U" cut. We don't have trustworthily documentation on if the edges are just rounds, or they match the toy are are curved in front and trained in back... It doesn't discount the rectangle shape. The cloak may just be a pull on hood, or strips cut from the center "U' and just wrapped around her neck. The underdress fabric can be seen up close. 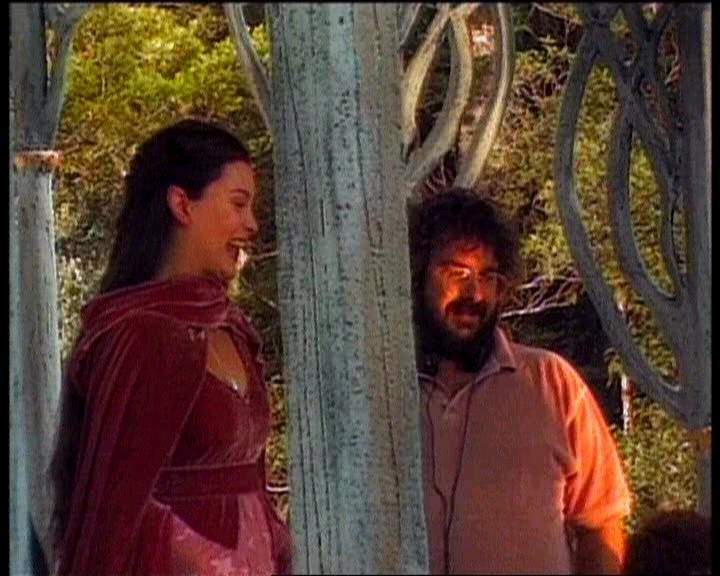 It is used as the costume chapter's boarder edge in "the Lord of the Rings: the Making of the Movie Trilogy"
It looks just like a regular hooded cape, pleated in the back for fullness. Either that or it is made similar to the Return of the Jedi Endor poncho where it is gathered around the neck but wide enough to pull up into a hood. Since the rose dress is never actually seen, the hair is even harder to figure out. However, we have a Burger King doll that was released in Singapore/UK that does show the hair. Exhibit pictures thanks to Steve J.